Today was supposed to be a "Top Ten Tuesday". It was supposed to be the "top ten books I wish had more ? in them." It was going to be books that I felt needed more people to die. I'm fully aware that this makes me sound extremely morbid. It's not that I necessarily want characters to die, but one of my biggest reading pet peeves is too clean of an ending. I love "happily ever after", but not at the expense of the story. Battles are tragic. Death happens. When it doesn't, sometimes it just feels wrong. Really. I promise I'm a happy person! 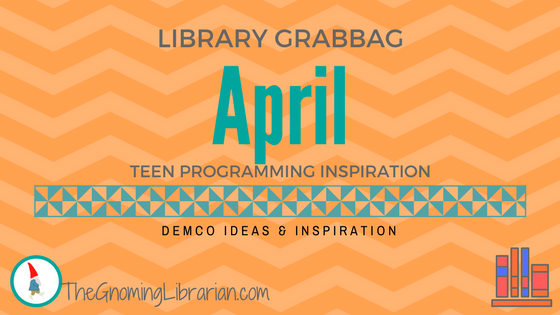 But I didn't plan ahead, and I'm just plain tired after celebrating the library's 100th birthday yesterday, so instead, I thought I'd share the newest DEMCO teen programming calendar. That's still a good time! I've had SO much fun working on these, and it's hard to believe that very soon I will have made a year's worth (currently working on July). Anything you would like to see more of? 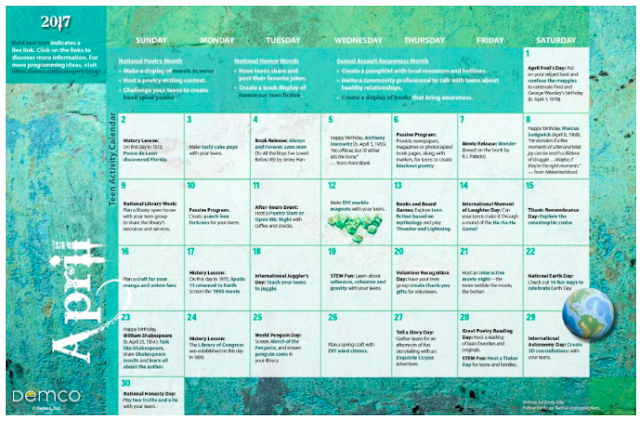 Click here for a downloadable version on DEMCO's Ideas & Inspiration blog.